The battle over the Budget Control Act -- and the cuts contained in it known as the sequester -- is as much about tax increases as it is about spending. That fact might have gotten lost in recent days amid press conferences and photo ops from President Barack Obama, his Cabinet officers, and Democratic members of Congress warning of meat inspectors being furloughed, trucks being slowed by long delays in Customs inspections at U.S. ports of entry, and the canceled deployment of an aircraft carrier to the Persian Gulf. Obama and his allies argue that to help avert the $44 billion in cuts to federal outlays required by the Budget Control Act in this fiscal year, another round of tax increases is required. Democrats later this week will bring to the Senate floor a bill to replace the spending cuts with $55 billion in tax increases on people with incomes greater than $1 million, higher taxes on the oil industry, and changes in rules on U.S. corporations with foreign operations. The Democrats’ bill would also trim subsidies to farmers and make smaller cuts to defense spending than the reductions in the Budget Control Act. Sen. Pat Toomey, R-Pa., joins Morning Joe to discuss why President Obama should be the one to decide where to cut spending with regards to the sequester. One way to look at the tax side of the battle is that Obama has an unfinished project which he detailed in his first budget blueprint in 2009, with an array of tax increase proposals. In his first term, he succeeded in shifting more of the tax burden to higher-income Americans and to U.S. coporations, first with the $400 billion in tax increases over ten years in the 2010 Affordable Care Act and then with the income tax increase he signed into law on Jan. 2, which the Congressional Budget Office estimates will raise between $600 billion and $700 billion over ten years. But there are more tax increases that Obama asked for that he has not achieved yet. The current showdown with congressional Republicans is another occasion to get them. Obama has proposed a ten-year $580 billion package of tax increases, such as $2 billion in revenue from changing the tax depreciation schedule for general aviation aircraft, including corporate-owned or leased jets. That idea raises the hackles of Sen. Pat Roberts, R- Kansas. Beechcraft Corp. and other jet manufacturers are based in Wichita, Kansas; Roberts said 40,000 jobs in his state are at stake. “Not only do they propose that (tax increase), but the language in which they describe it, it’s always ‘fat cat corporate jets,’” complained Roberts. 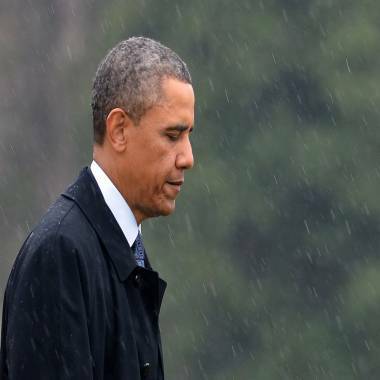 President Barack Obama walks in the rain to the Oval Office on Feb. 26, 2013 upon returning to the White House in Washington. On principle, Republicans object to Obama seeking to raise taxes again on some immediately after getting his tax increase at end of 2012. And there’s another reason Republicans oppose any just-get-us-past-this-crisis tax hike: every change in tax law they might agree to now chips away at what some GOP leaders hope to do as part of comprehensive tax reform later this year. Rep. Dave Camp, R- Mich., the chairman of the tax-writing House Ways and Means Committee told reporters Tuesday, “I’m not interested in a one-off (tax reform or tax increase). … What I’m interested in is a comprehensive effort” to redesign the entire tax code, both the corporate tax and the individual income tax. He added, “I’m not interested in more revenue at this point. The comprehensive reform I’m looking at is revenue neutral. As some people say, 'We gave at the office at the end of the year’” – meaning the tax increase Obama signed into law on Jan. 2 is all he is going to get. On the spending side of the battle, some Republicans seem to acknowledge that Obama’s campaign to portray the $44 billion in spending cuts as disruptive and potentially disastrous is having some effect. But some Republicans argue that it might useful to see how Americans do with $44 billion less in spending -- out of more than $3.5 trillion in total federal outlays this year. “I think it would be a wonderful test of whether or not we have the ability to actually reduce spending in Washington D.C.,” said Rep. Mick Mulvaney, R- S.C. He said he supports a Senate Republican effort to give Obama and his aides some flexibility in how they administer the cuts “so they can make the least disruptive cuts possible.” But in Obama’s test of wills with congressional Republicans, that kind of flexibility might not be in Obama’s tactical interest.